An initiative to support the organizations who support people in our community that rely on local food banks has generated $21,000. 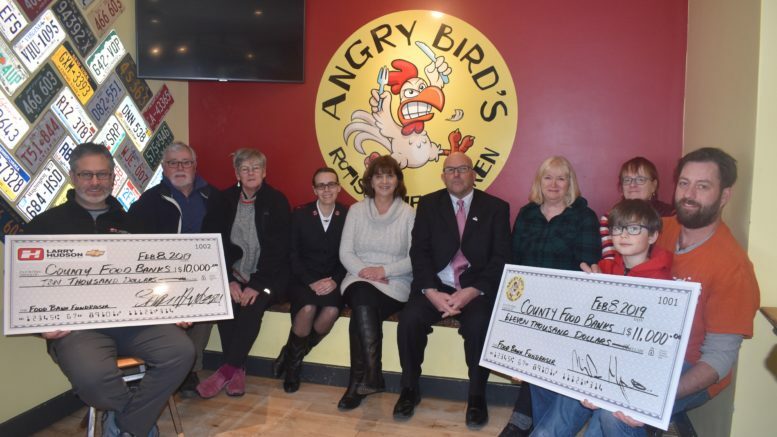 Local businessman Micheal Hymus presented cheques for $7,000 each to the Wellington Storehouse Food Bank, the Picton United Church County Food Bank and the Picton chapter of the Salvation Army at his popular Angry Birds Rotisserie Chicken Restaurant in Picton on Friday afternoon. Contacted earlier this month with the good news a healthy donation was going to be sent their way, the presentations caught the various food banks and their organizers completely off guard. While some food bank representatives heard Hymus’s restaurant had pledged to donate a week’s worth of proceeds to local food bank concerns in mid-January, the amount generated through meal sales and a matching pledge from a Western Ontario automotive dealership was both shocking and warmly received Friday. Hymus’ other business revolves around exporting Canadian passenger vehicles and trucks to the United States and the operations are driven by the economy and the US dollar. A sudden spike in the U.S. Dollar means the Hymus’ operation does very well. But that sudden uptick in the fluctuating value of an American greenback also has repercussions. “When we see the US dollar spike, we do very well. But when that happens, we see the price of food climb and it’s difficult for me on a personal level to see myself and my business prosper but on the same hand see my community suffer,” Hymus told the Gazette. It was a recent phone conversation he had with his mother that made him realize that the U.S. Dollar value compared to its Canadian counterpart had tough consequences on those subsisting in the margins in this and other communities. and I really hadn’t paid too much attention to any of that but then she started to rhyme off all the increases at the grocery store and said ‘There’s people living right here in Prince Edward County that can’t afford to eat.’ And here I am having one of the best years in my life,” Hymus added. So a week’s worth of food sales at Angry Birds was the way Hymus was going to help three main and busy food banks in Prince Edward County. The week-long campaign Jan. 10-16 was advertised through a number of social media channels and news of this campaign spread to a business parter Hymus has in the automotive sales industry. As are local food banks and those that organize them. Linda Downey admitted she had no idea such a donation was in the offing until she was notified by Hymus’ representatives earlier this month. “It’s such a nice surprise, we didn’t have a clue this was coming so this is wonderful and we need to thank Mike, his customers and everyone involved in this very generous gift,” Downey said. Typically, the food bank in Wellington that serves about 320 clients twice a month is stretching funds even more in the aftermath of Christmas. Organizers at the Picton United Church County Food Bank had heard of the Angry Birds campaign but had no idea the effort would generate this type of funding. Salvation Army Lieutenant Donna Ludlow said the organization’s food bank which services around 50 local households would, like the other food banks, be able to utilize the funds for dairy and perishable purchases.